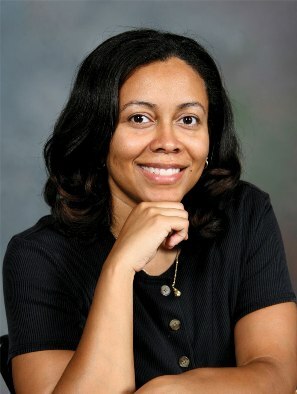 Marta is currently doing research at Spelman College on techniques using laser light to "weld" a special glue to knee cartilage, repairing tears and strengthening the tissue. In addition to meeting the challenge of optimizing the composition of the glue, Marta also has to ensure that the heat from the laser does not damage the cartilage itself. In addition to her research, Marta also helps students understand how fascinating Physics can be through the physics and astronomy courses she teaches--even using modern science fiction movies (such as "Armageddon") to help students understand physics concepts. Before Marta came to Spelman, she attended graduate school at MIT, where she first began studying lasers and knee cartilage. Marta Dark McNeese was born in a suburb outside of Washington, D.C. She remembers being interested in math and the sciences as early as fifth grade. "I liked the idea that there was a process to learn and problems to solve in math and science, and I remember thinking of other topics--like history--as dates and things to memorize, " she said. Marta's interest in physics and astronomy deepened as she went through middle school to high school--which was a special school she had applied to because it had a science and math program. While there, she took a number of difference science classes, but found that she didn't like biology or chemistry. "Physics was the one for me, " she said. When she was in eighth grade physical sciences class, Marta found that she could especially identify with her instructor, who was an African-American woman. Since then, Marta has endeavored to be a mentor to other young women similar with similar experiences through her work at Spelman college. Spelman is "a wonderful environment for me, and I really wanted to be there so I could encourage young black women to go into the sciences, " Marta says. And to those few students who maybe don't get the appeal of physics right off the bat, Marta says, "You're really trying to understand how the universe works. What could be more exciting than that?"